The number of Spaniards who work, directly or indirectly, in the Health Sector exceeds one million. Some authors even venture two million, counting more indirect employees. Surpassing the figure of one million is simple if we consider not only medical and pharmaceutical care, but related segments like elderly patients care, cosmetics, nutrition or animal health. An increase in the next decades can be foreseen, given the continuous demand of health on the part of the population. The key of this increase in Spain is that, -unlike what happened in previous generations-, more and more citizens are willing to pay from their own pocket a complement for some treatments, on top of the contribution via taxes. Every day we see a growing tendency to use dentists, paediatricians, ophthalmologists, gynaecologists, hearing aids, plastic surgeons, etc. All this growth is translated into an increase of the employment in the sector. A differential characteristic of this personnel working in Health is the professional qualification, that is remarkable with respect to other sectors, arriving to have almost 600,000 registered professionals. Farmaindustria esteems that more of 40% of the personnel employed by the pharmaceutical industry has a specific qualification, and there, University degrees are more than a half. Employment in this sector shares three vectors that condition their careers: 1) permanent innovation that forces to a continuing update of knowledge, 2) specific legislation and regulatory subjects – a formidable challenge for outsiders, and 3) the role of the prescriber, -not in all cases the doctor-. In Spain the biggest employer in health is the public sector. However, that no longer consolidates numbers in which was denominated INSALUD, since from the beginning of the century our 17 autonomous communities (CCAA) have HR competences transferred and count on his own personnel (SAS, ICS, Osakidetza, Sermas,etc.) and to collect homogeneous data is now a titanic task. 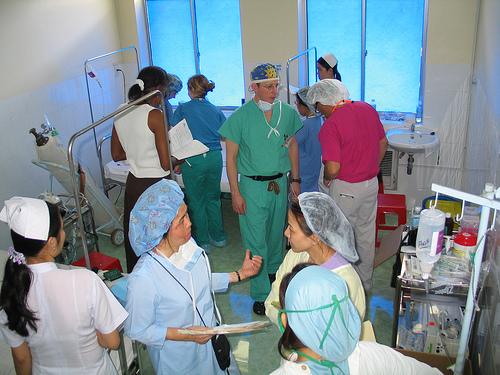 As a last consolidated reference, -at the end of year 2000-, INSALUD counted 29,310 physicians, 68,225 non-physicians and 38,195 non-sanitary, totalling 135,730 people. It seems likely that in these ten years the CCAA will be using more personnel, although the total figure is now imprecise. The data of registered sanitary professionals by theINE in year 2007 offers another valuable reference with nearly 600,000 professional registered, although some could be professionally non-active. On another segment, the Pharmaceutical Industry employs more than 39,100 people according to Farmaindustria data of 2007. A tendency observed is the encouraging growth of R&D activities , employing 4,616 professionals almost a 12% of the total. In traditional Pharmaceuticals growth is coming from hospital specialties like Oncology, Transplant, orphan drugs, etc, with reductions now widespread in Primary Care, and therapeutic areas already well covered like Digestive, Ostheoarticular, Respiratory, etc. An excellent analysis Luis . I think the future of health profiles in Spain is going to be shocked or affected by both the immigration and the emigration, as is increasingly common to see new foreign professionals who come from the third world and local professionals in the opposite way who go to other countries, so there is some kind of flow. You are right about current and future work flows. Physicians are a case in point and will deserve its own single analysis.